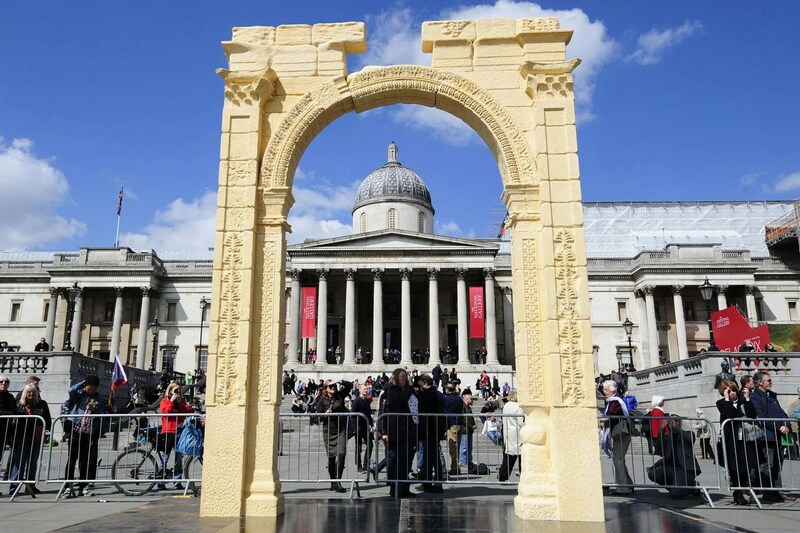 Archway Of Triumph (Baal) Built And In Trafalgar Square – Coercion Code – "Dark Times are upon us"
A 2,000-year-old Syrian monument destroyed by Isil militants has been recreated in London’s Trafalgar Square. The 15ft scale model of Palmyra’s destroyed Triumphal Arch was made from marble using 3D technology from photographs of the original. 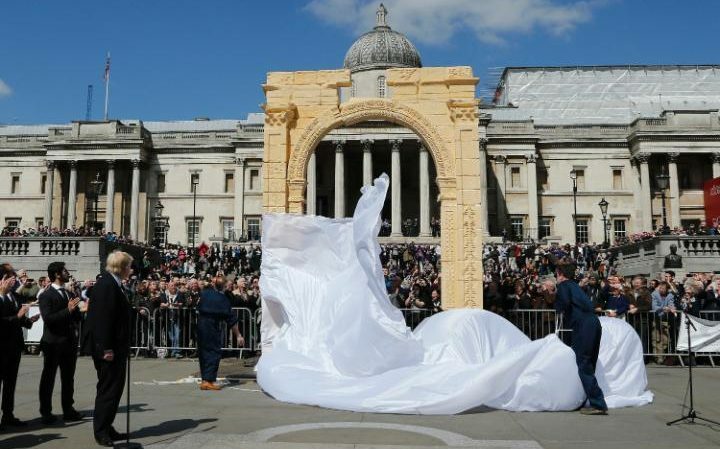 It was created by experts from the Institute of Digital Archaeology (IDA) and then transported to Britain, before being rebuilt in the capital in what has been described as an “act of solidarity”. 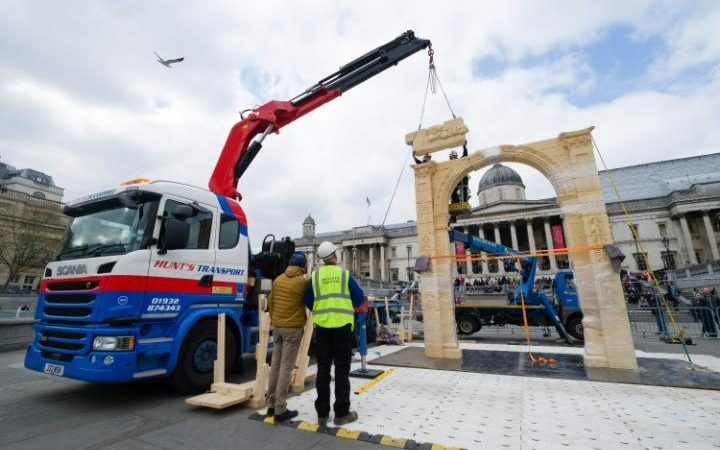 The two-thirds scale replica – which was officially unveiled by Boris Johnson, the Mayor of London, on Tuesday afternoon – will be on display in the capital for three days. 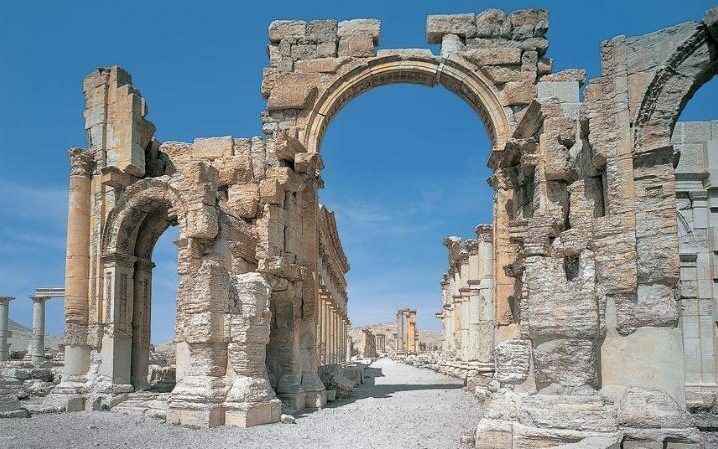 It will then move to other cities, including New York and Dubai, before it is expected to be taken to Palmyra next year where it is hoped a permanent home near the original arch can be found. Experts from Oxford and Harvard universities worked on the project with the IDA after the original monument was blown up Islamic State of Iraq and the Levant (Isil) in October last year. “It is a message of raising awareness in the world,” Maamoun Abdulkarim, Syria’s director of antiquities who was in London to watch the replica being installed, told the BBC. 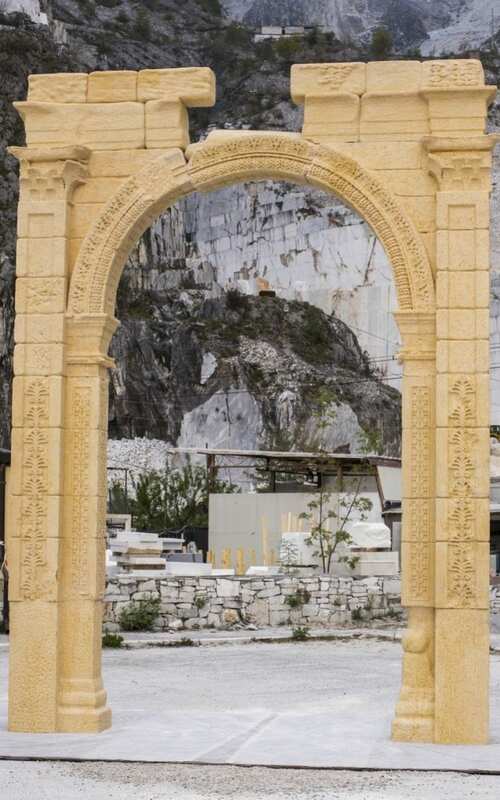 Pictures taken at the marble caves of Carrara in Italy last week showed the 15ft (4.5m) replica ornamental archway being given the finishing touches by experts. Palmyra was recaptured at the end of March after being overrun by Isil militants last May. Earlier this week, the first foreign experts who visited the museum in Palmyra after it was taken over from Isil said they spent a week collecting fragments of priceless broken sculptures from the grounds in a rescue mission they hope will help salvage most of its contents. Bartosz Markowski, from the Polish Archaeological Center at the University of Warsaw, said that most of the 200 objects which were exhibited on the ground floor of the Palmyra museum were destroyed, many of them apparently with hard tools like hammers. Many artefacts have been stolen, he added, thought it was not possible to know how many. In addition the following is an article/blog I found which provides some excellent background to our MODERN PAGANISM. The worldwide attention centered on the Gateway to the Temple of Ba’al planned to be replicated in London and New York, amongst other sites around the world is just half the story. This time segment began on April 18, 2016 and ended on the 22nd. The Arch of Triumph is said to rise in Times Square sometime towards the end of 2017. 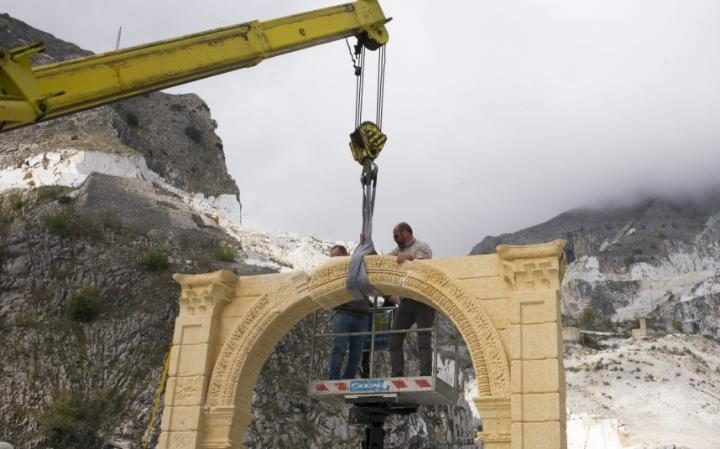 The ‘official’ rationale for the arch or ‘gateway’ replica to the city of Ba’al is that such a public statement serves as a symbol of protest against religious extremism, but Islam was not implicated. Although the ancient Greek and Roman ruins are amazing cultural artifacts, they represent the Satanic practices to Ba’al, the god of sexual perversion and child sacrifices, as in abortions that Humanity has now accepted as ‘life choices’ and are now legislatively protected as civil rights. Such ‘gateways’ of Ba’al being erected are but the symptoms of the prevailing depraved spiritual condition of the world in need YHVH’s salvation that can only be found in the Prince of Life, Jesus Christ. The Gateways of Ba’al being erected now in these Last Days are in actuality showing the defiance of the likes of the Luciferians, Masons and the Synagogue of Satan that are against YHVH’s Prince and His Peoples. The other half of the ‘story’ has to do with Ba’al’s consort, the Spirit of Jezebel, the Queen of Heaven as in Isis that like Jezebel in the Days of Elijah is the complement of Ba’al; whose spirit is also being let loose in these Last Days. It is now and will be like the Days of Elijah that such a Prophet of YHVH had to contend with such a ‘Queen’ and the rebellious nation of Israel and the lukewarm spiritual condition of YHVH’s People. Such a time was when there was a 3.5- year drought and a spiritual one as well – as it is today with YHVH’s People, foremost Israel and the Church of Laodicea, the last Church Age before the Rapture. 2 The Synchronicity of Personages It is the LORD Jesus Christ that attests to such dire spiritual conditions of Israel and His Church in these Last Days. Once again, according to the Bible, Elijah will come during the Tribulation period to deal with such idolatry ascribed to Ba’al and Jeze-bel, as in sexual perversion of ‘alternative lifestyles’, persecution of YHVH’s People and outright Satanic child sacrifices in the form of abortion mills to name a few. The coming Prophet, Elijah will deal with the ‘Synagogue of Satan’ that plagues the Jewish People as Jesus is presently dealing with the lukewarm spirit of His church most predominantly in ‘Laodicean Age’ just before the Rapture occurs. Perhaps as it was the case of Israel in the Days of Elijah with Ahab and Jezebel, the contention was with the worship and spirit of Ba’al and Jezebel…so it is today and will be during the Tribulation period or the Time of Jacob’s Trouble. This study suggests that the Last Days will see a ‘playback’ of perhaps a literal ‘Queen of Heaven’…an Isis female figure to rule. Could such a woman with a Jezebel spirit and an Ahab exist currently in the nation of America in her ‘last political chapter’ or the world at large for that matter? Can it be that perhaps the Talmudic Wizards of Ba’al that ‘chose’ the U.S. Presidents will appoint the female Democratic contender to be ‘selected’ as the next U.S. President? Why such Gateways of Ba’al and his consort Isis are being erected in London and New York is that such are the Luciferian world capitals of the spirit of rebellion and defiance against YHVH. Such centers are ruled by the Talmudic Wizards of Ba’al and Prophetesses of Isis or Gaia. Is it any wonder also that Obama happens to visit Britain during this 3-day and 3-night period as the Prince of Life, Jesus was 3 days and nights in Sheol from Passover? It is no coincidence that such a Gateway replica was made to coincide with the Druidic and ancient Celtic Feast of the Beast in Britain on the Full Moon no less. The religious covens and numerous other types of followers of modernday Ba’al and Jeze-bel still engage in sexual perverted rituals and sacrifice human infants, burning them alive as in the Days of Elijah and Nimrod. Sept 13, 2015 | ————– 33 weeks ————— | Start of 5776 Aug 19, 2016 May 1, 2016 May 14, 2016 Year of Lucis |——————- |——-13 days ——|—— + 13 days——–| (Lucifer) Feast of the Beast Bel-tane Israel Independence | Pentecost (Western 15th) Aug 22, 2016 (Passover (Rabbinical). The Luciferians and their various associates not only worship Lucifer in the form of Ba’al but Isis in the form of Mother Nature, Mother Earth. This day of worship of Mother Isis occurs on Earth Day which is April 22, 2016. Gaia is another euphemism for ISIS, the Queen of Heaven whose companion was the owl, Molech as in the Bohemian Grove of Sonoma County in Northern California where the Cremation of Care eulogizes such a celebration of the slaughtered. In 2016 or 5776, the date happens to coincide with the Rabbinical observance of Passover on the 22nd of April. It is when Jesus, the Prince of Life died for the sins of the world as the Passover Lamb of YHVH. 3 Historical Context The ‘Feast of the Beast’ of Ba’al is halfway between the Spring Equinox and the Summer Solstice. It marked the first day of summer in ancient times, initiating a 13-day period culminating on May 1st with ‘The Blood Sacrifice to the Beast. What is rather interesting is that exactly 33 weeks from the start of the Jewish year 5776 on September 13, 2015 is May 1, 2016, the Day of Ba’al. What will be also rather spectacular is that from May 1 to about the 17th, an ominous cosmic ‘double-cross’ will configure in the heavens. A unique planetary alignment will see 2 ‘crosses’ align. In folklore and in the occult, the double-cross stands for duplicity, deception and deceit. Perhaps the world is entering the time of the coming Age of Deceit ruled by the spirit of Ba’al and Jezebel. Within this timeframe of May, the rare Transit of Mercury will occur and the Western celebration of Pentecost takes place a day after the independence of Israel on the 14th of May. Interesting, the Temple of Ba’al was consecrated in 32 AD. It is rather interesting that some Biblical scholars attribute the death of the Prince, Jesus the Messiah in that same year, on Passover of 32 AD. The time difference from 32 AD to the Year of Light 5776 or 2016 is 1984 years. The year 1984 is the title of the same book by Orwell that foretells of a nuclear war, police state and New World Order. Will such a time signal such a coming turning point prophetically even? As it is, the year 5776 is considered by the Luciferians as the Year of their Dark Lord, Lucifer thus the Year of Light or the Light-Bearer. 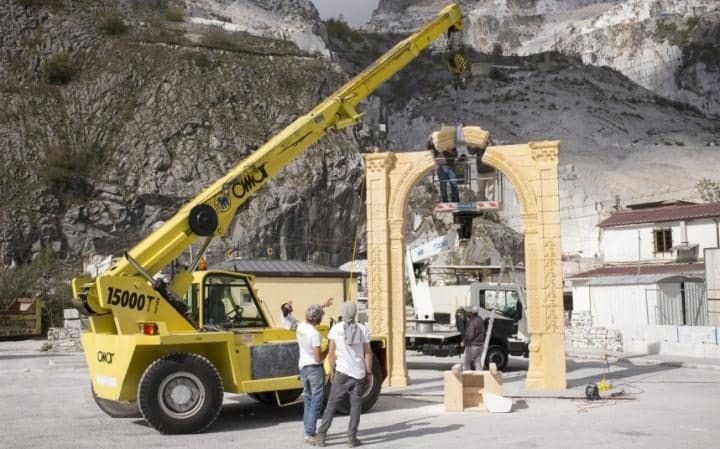 Could such public displays of the replica of Ba’al’s gateways be attributed to the soon coming Dark Lord? The Temple of Ba’al is considered one of the most important pagan sites in the Middle East next to Baalbek. The Syrian city of Palmyra, Tadmur in Arabic was known as the ‘Pearl of the Desert’ and designated a World Heritage site by UNESCO. It was this part of the Middle East that was carved out of one of the 4 Generals of Alexander the Great, that of Seleucus I Nicator. The attributes of the coming AntiChrist are said to be an Assyrian and it is from this lineage that Antiochus IV Epiphanes, which mean ‘God Manifest’, was as a type of the coming AntiChrist that caused the Abomination of Desolation in the Temple of YHVH and will again during the ‘Hour of Trial’ or the Tribulation period. It is his dynasty that the Biblical connotation of the type of the AntiChrist comes from to some degree. This complex to Ba’al stands in the middle of a desert about 150 miles northeast of Damascus, Syria. Why it became a major thriving center of commerce was because it was well traveled by the caravans of the Silk Road. In August 2015, the various Temples of the Ba’al complex were destroyed by ISIS. Specific to Palmyra, the Temple of Baalshamin, the Temple of Ba’al and the Arch of Triumph were destroyed. Cultural vandalism is not new to the Middle East; nor is Muslim militants’ targeting of ancient Jewish and Christian sites there and elsewhere in the Temple Mount for example. Yet why have not the altars or arches of such Christian churches not been instead erected? The Muslims are blowing up tombs, such that of the Prophet Jonah and destroying statues because they consider them to be blasphemous. 4 The Rise of Ba’al Rebellion It is said that the organization behind the presentation and placements of the replicas of the Arch of Triumph of Palmyra is the Institute of Digital Archaeology. According to some research, such a venture is the result of a joint partnership amongst Harvard University, the University of Oxford and Dubai’s Museum of the Future. A 3-D printed model was used to create the replica. It is also said, that the replica of the Palmyra Arch in Trafalgar Square with the Column of Nelson is laid-out in the same pattern as the Washington Masonic Mall and the Vatican among other Luciferian Masonic motifs. What is also rather unique is that the distance from Palmyra where the Masonic Temple of Ba’al is situated to London and then New York forms a nearly perfect ley-line. The Gate to the entrance on the west side of the Temple of Ba’al is mathematically precise and in phi ratio to the temple and complex. The Temple of Ba’al is actually laid out in a Masonic floor pattern and orientation as the entrance to a Masonic Temple is on the West side. The following measurements are taken from GoogleEarth approximate distances and reveal the iconoclastic signatures of the Masonic and Luciferians signatures steeped in numerology. 5 – The Coming Age of Ba’al Bel-tane, which is the worship of Ba’al is the 2nd most high-holy day of the Luciferian Wizards, Warlocks and Prophetesses. There is a phallic symbols associated with Ba’al worship and ritualistic human blood sacrifices. This is called the May Pole or the Obelisk as in the Egyptian Washington Monument which is called, ironically the Shaft of Ba’al. Beltane is known in the Western world as May Day thanks to the Talmudic Soviet socialists and communists who venerate Luciferianism and destroyed Christian Russia for example. For the most part, such were Luciferin Talmudic High Priests of Ba’al incognito. In the similar spirit, it has been the Muslim ISIS that has either attacked and/or destroyed all the ancient shrines as well as many Christian churches and monasteries in the Middle East like the Luciferian Zionist Soviets of Russia. To the Luciferians, these monumental gateways replicas are a celebration of the slaughtered, of the thousands of Christians and the innocent of the Middle East. The genocide of Christians mainly by ISIS now in the Muslim nations was created and funded by the CIA and MOSSAD and others. It has its acronym ISIS in English for Israel Security Intelligence Service that even the U.S. Pentagon now admits is the case. Such have been the proxy army of the Globalist Luciferian and Synagogue of Satan by way of the CIA and funded by the drug trade that seeks to triumph over the Prince of Life still and over His People while they are still on Earth. Such replicas of the Portals of Ba’al go hand-in-hand with their spirit of the Lucifer that glorifies rebellion and defiance, foremost against YHVH and the Christian witness in the Middle East in particular. If anything, the Luciferians are replicating the Arch of Triumph over the Prince of Life and the People of YHVH as a ‘triumph’ during the Jewish observance of Passover as such have nearly eradicated the Christian testimony of the Middle East. The modern-day Luciferian religious practices were epitomized by Nimrod and Semiramis in the very heart of the Plains of Shinar no sooner than the New World Order began after the Flood of Noah. Such a spirit of Nimrod, of Lucifer and his perversion later on plagued the nation of Israel under King Ahab and Queen Jezebel. It was Jezebel that sponsored and protected the Priests of Ba’al and persecuted the People of YHVH in the land of Israel during the Days of Elijah. Such a spirit of Jezebel is one that entices the People of Jesus to commit sexual immorality that causes compromise and a diminishing of the Testimony to Jesus on Earth. What is sad is that there is a ‘Spirit of Jezebel’ that is prevalent in the Church. For Israel, it will take a Time of Jacob’s Trouble to root-out this Luciferian spirit of Ba’al and Jezebel. It will be Elijah that will bring Israel to the Valley of Decision once again to confront the Synagogue of Satan and ‘sin in the camp’. For the lukewarm Christian Church of the West primarily, it will take persecution and tribulation for it to wake up. The modern secular world that has legislated prayer and Christ Jesus out of the ‘public square’ has been replaced and filled with such a Spirit of Ba’al and Jezebel, that which glorifies perversion and murder of the aborted innocent. Such Satanic practices then as now are considered and labeled alternative lifestyles, life choices, pro-choice and progressive emancipation. 6 These are the very same practices that leads to defilement, abortions, etc., and eventual rebuke from the LORD of the Church and the Wrath of the Lamb to come for distorting the Creator’s original design. Even in the Church of Jesus Christ concerning the last Church Age spanning that of Laodicea, Jesus is outside ‘knocking at the door’ trying to come in and have fellowship. The lukewarm and compromised Church in this last stage of the Church Age of Grace has to be confronted also; who really is the Head of the Church, Jesus or Jezebel? Who is ‘LORD’ in one’s life and who will the Church, as a Queen will follow as ‘husband’. As it is, the Church of Laodicea, much like Israel in the Days of Elijah is lukewarm, undecided as was and is Israel concerning the Lordship of YHVH. As it was with the indecisiveness of YHVH’s People when Israel was summoned by Elijah to the ‘Valley of Decision’, so too is the Last Day’s Elijah again will confront Israel about the worship of Ba’al and the Spirit of Jezebel. During the Tribulation, the nation of Israel literally will be brought down to the Valley of Megiddo, in the Battle of Armageddon to choose and decide once again who is GOD. ‘If Ba’al is God, follow him, if YHVH is GOD, follow him…’ Israel, Church. In this last case, it will not be fire that will come down from Heaven but the very Light of the World, the Prince of Life – Jesus Christ that was died but is alive forevermore. It is He, the Messiah of Israel, the LORD of the Church that is to be worshipped alone. It is His Gate that needs to be open. Jesus attested to this reality that He alone is the ‘Door’, the true Gateway to salvation and Eternal Life.